Andrea Zani (1696-1757) was active in his native northern Italy but his career included an extended period in Vienna in the 1730s, where he enjoyed the patronage of Count von Schönborn. These 12 cello concertos survive in manuscript parts in the Schönborn archive and have been rediscovered by Zani’s biographer, the New Zealand musicologist Jill Ward. They make a notable addition to the 18th-century cello repertoire; the idiom is quite Vivaldian but tending towards the decorative elegance characteristic of the middle of the 1700s and demonstrating a distinctive, pleasing melodic quality. The concertos appear to have been designed as a set: the first eight alternate the major and minor tonalities of the cello’s open strings (A, D, G, C; this recording presents them in a different order). The writing for cello and strings is varied, its contrasts nicely underlined here by the continuo group’s switching between harpsichord and organ, theorbo and guitar. Throughout, the playing of the Kölner Akademie is admirably light and airy. Occasionally I felt that a gentler, more spacious approach would have given greater emphasis to the music’s cantabile qualities. This is particularly the case at the start of Concerto No 1. 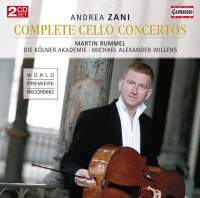 Martin Rummel’s cello has a modern set-up; his bowing technique results in some passagework sounding too forceful. But he’s a splendidly agile player and in the slow movements he phrases most expressively, though he does show a strange partiality for short grace notes, introducing them at many places where the context suggests a long appoggiatura. A fascinating issue, nonetheless.